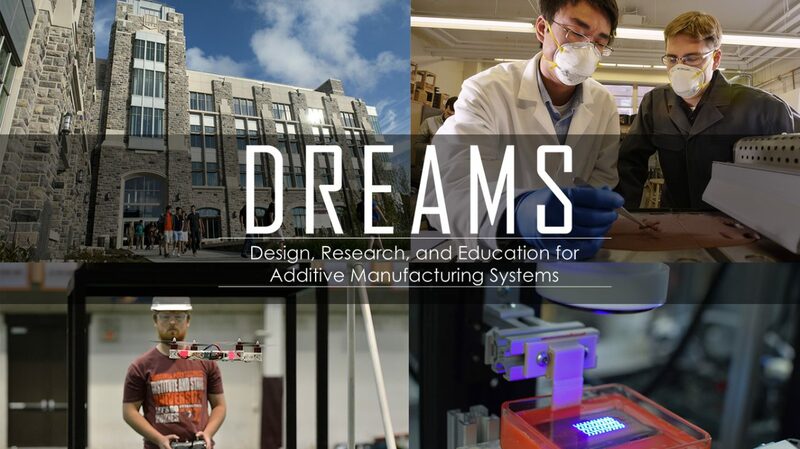 Welcome to the Design, Research, and Education for Additive Manufacturing Systems (DREAMS) Laboratory! The members of the DREAMS Lab are driven by a vision of the future wherein the layered fabrication techniques of today's "rapid prototyping" technologies are of a maturity to be considered as viable platforms for the manufacture of end-use artifacts. Our research mission is to be a leader in the transition of rapid prototyping technologies to the new paradigm of additive manufacturing. Design for Additive Manufacturing: We research methods and tools to support designers in their use of additive manufacturing technologies for innovative applications. Process Optimization and Materials: We research and develop new material systems, novel manufacturing process chains, and new fabrication technologies. Education: Generally, we research the what, why, and how of design education. Specifically, we explore the role in which additive manufacturing systems play in the processes of design and engineering education. An early demonstration of off-axis 3D printing using a robotic arm int the Virginia Tech DREAMS Lab. This demonstration was created for the 2017 ACCelerate Festival in the Smithsonian Institute's National American History Museum. DREAMS Lab students, in collaboration with the Carillion Medicine & Research Institute, created a 3D Printed heart model using patient-specific CT data. Embedded magnets enabled 'windows' into the heart to help with visualizing transcatheter valve repair procedures.